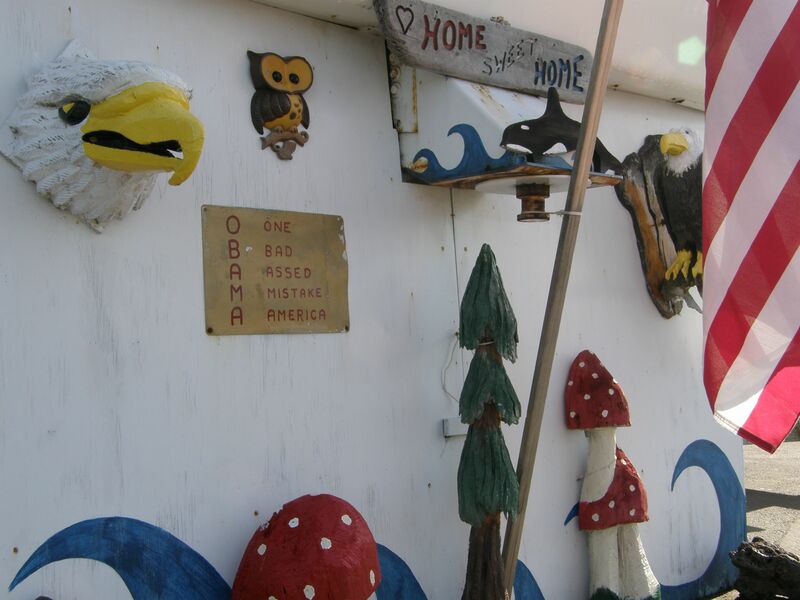 On my morning walk down to see the harbor I past a trailer covered in wood figurines, American flags and a hand painted sign that said OBAMA: One Bad Assed Mistake America. I knew I wanted to talk to whoever lived there, but I was shy to impose myself on them without knowing whether my interest would be seen as offensive. There were two men standing across the parking lot, so I walked over and told them what I was doing and asked them whether they knew the person who lived there. I was hoping that maybe one of them did, and feeling that somehow it was more socially acceptable to approach a person outside than to knock on their door. They knew the owner, and told me he was often around. Just then they saw him walk out with his dog and called to him. He was a grey haired man with skull and cross bones on his red shirt. I said hello, explained that I was trying to learn more about how conservative people think about our country, and asked him whether he would be willing to talk with me. He told me I wouldn’t want to hear what he had to say. I insisted I would. I read my flag sign to him and he seemed pleased with the statement. He started raging against liberals, but in a blustery way that didn’t feel personal at all – actually it just felt like he had so much to say he could barely make himself stop once he got started. He definitely seemed to want to be listened to. But he had to take his dog for a walk first, so we agreed to meet back at his place in 30min and I went and ate breakfast. When I returned he saw me from his window, came out and asked me to sit down at the picnic bench on the sunny side of his place. He was from Scotland, and said he had traveled all over Europe before deciding to move to the United States, because he had concluded it was the best country in the world. He said growing up in Scotland there was no way for him to change his position in society and the work that was available for poorer people like him was dangerous, like mining and fishing the North Sea. He said that after living expenses and taxes there was no way for a person to get ahead there. His dad had started a motorcycle club in their town when he had retired from the air force, and as a young man he had decided to one up his father by joining the Hells Angels and moving to California. He had spent most of his adult life as an artist and biker, and he was proud to have his artwork in Hells Angels clubhouses around the world. 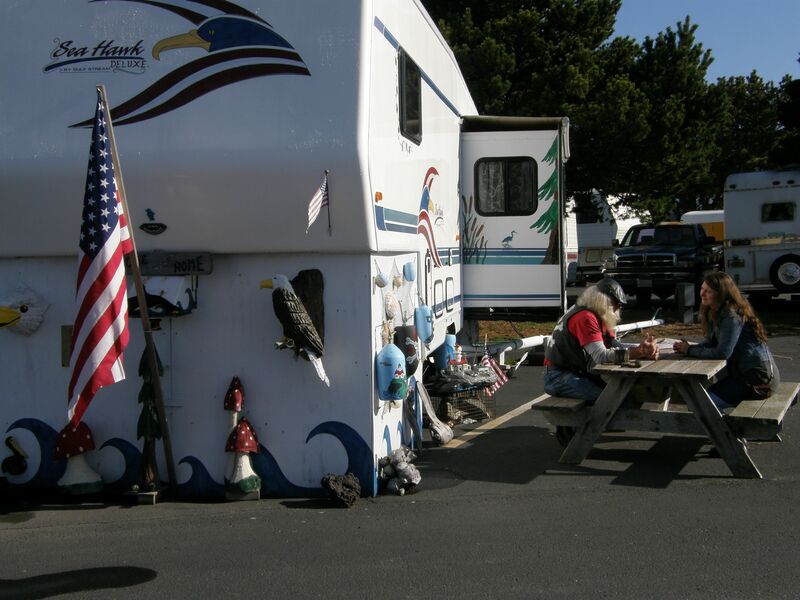 He had made his living selling his wares on the side of the street in cities he traveled through, but now he couldn’t do that because you need a permit to sell things anywhere. He felt the United States was heading away from it’s former glory because everything was becoming more and more regulated. His motorcycle had gotten impounded a while back and he had asked the guy who ran the towing company if he could work off the fines by doing something around the lot, but the guy claimed he couldn’t let him do any work because he wasn’t properly licensed. I agreed that we are becoming a more and more regulated country, but questioned whether it was really the Democrats and Liberals fault. He said even the Republicans weren’t doing a very good job these days, but at least they have the right idea about less government, less taxes, and less regulation. He had left the Hells Angels at some point and found god. He said the devil is always right there with you encouraging you to do bad things, but then he’s nowhere to be found when you have to pay for the consequences of your actions. He said he felt a calm he’d never before known, because he didn’t need to worry anymore if every cop was out to get him since he has been living right with Christ. He spoke with fury in his voice most of the time, as if he would be more persuasive the more furiously he spoke. But he seemed really glad to talk and shook my hand warmly when I said I had to go, even though he a hard time stopping the flow of his rant.